Service: Get The Attention You Deserve. Every Day. At Hooper Handling, located in Buffalo, NY, superior service is the root cause for return customers each and every day. We take immense pride in how we partner with them, and do whatever it takes for them to be successful. And we will do the same for your business. At Hooper Handling, we understand that when you need service, you need it done right and you need it done now – whether it is on site at your location, or at ours. 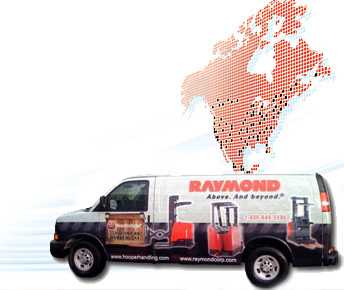 Our team of service professionals are experts at providing the maintenance your lift trucks need, and are able to have you back up and moving product at full capacity in no time. And as a testament to our dedication, we maintain an average on-site time for our service technicians of well below four hours from the initial request. Each Hooper service vehicle is outfitted with a comprehensive array of the parts and equipment needed to maintain your lift trucks, which enables us to expedite on-site maintenance, repairs and troubleshooting, therefore reducing downtime and keeping you moving forward. Hooper Handling offers a range of asset protection programs to satisfy all of your lift truck needs. Click here to make a Service Request.